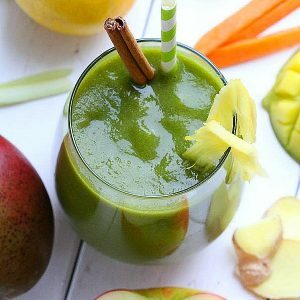 This delicious vegan non-dairy, sugar-free green detox smoothie is loaded with spinach, kale and tons of fiber, antioxidants, and immune boosting nutrients for optimum health. Place all the ingredients in your high-performance blender (I used the Blendtec) in the order as they appear. Blend on high until completely smooth or until desired consistency is reached. Feel free to add more or less water depending on the consistency you prefer. I use water kefir but coconut water or any water you have on hand will work. I try not to add any type of sweeteners when I feel the need to detox but feel free to add a little bit of honey depending on your taste.